Commercial growout of marketable sized Murray cod is a developing industry within the Australian aquaculture scene. Yet, Murray cod by nature are aggressive, territorial predators, and as such require specialised techniques and husbandry skills to grow them successfully in captivity. Options for weaning Murray cod onto artificial diets and acclimation to the aquaculture environment are not well developed. 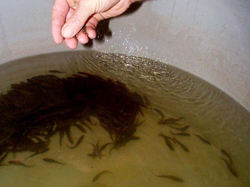 To date, many Murray cod farmers obtain seedstock as either post-larvae (< 15 mm, <1 month of age), or as pond-reared fingerlings (40-70mm, 2-3 months of age). Both these sizes of fish are able to be weaned onto artificial diets, but as yet insufficient information is available to determine the most appropriate and cost effective size at which to wean Murray cod. As an alternative, fully weaned seedstock may be purchased from the supplier. Although these fish will cost substantially more than non-weaned fish, the risks of losing fish during the weaning phase are eliminated. Staff at the Marine and Freshwater Resources Institute (MAFRI) are currently investigating the aquaculture of Murray cod as part of a joint FRDC/DNRE Project (FRDC #1999/328). 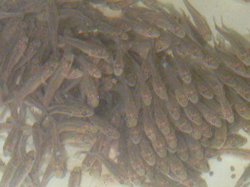 As part of this project, a weaning protocol for fingerling Murray cod in experimental scale trials has been developed. The description provided here may therefore assist farmers in weaning and rearing juvenile cod under commercial conditions, but as both research and development progress and more information is obtained, these methods may be refined and improved. Indeed this document is intended only as a preliminary guide, which will hopefully facilitate ongoing development of improved "Best Practice" weaning techniques within the industry. From the outset, it is important to emphasise that to effectively wean juvenile Murray cod, key factors such as seedstock condition, system design and operation, weaning strategy and diet quality, must be optimised to ensure a high weaning success and survival rates. Murray cod post-larvae are predominantly reared in shallow earthen ponds that have been fertilised to promote the production of zooplankton and other aquatic invertebrates on which the fish feed. At harvest, 5-8 weeks after stocking, fingerlings are typically between 40-70 mm in length. Fingerlings for weaning should be carefully selected, as stressed fish are less likely to accept an artificial diet. Seedstock for weaning should preferably be at least 35-40 mm in length (>0.5 g), of uniform size and free of diseases. To ensure that the fish are in good physical condition, the time between harvest and commencement of the weaning process should be kept to an absolute minimum (< 5 days). No attempt should be made to wean fish that are weak (or hollow-gutted). Where possible, you should seek a guarantee of condition of fish from the supplier. Indeed, a general health check should be undertaken on new fingerlings received from the supplier. This should include at least an examination for ecto-parasites. As a matter of routine, new fish must be quarantined from other stock within the hatchery/fish farm and be given a series of prophylactic treatments to prevent the potential spread of pathogens and ensure the new seedstock are free of parasites. Procedures for examination of fish for parasites, identification of parasites and several disease treatment options for Murray cod are given in Rowland and Ingram (1991). However, a good general-purpose therapeutic treatment for fingerlings is salt at 10 g/L for up to one hour, which may be applied as deemed necessary (daily) until satisfied with the condition of the fish. At MAFRI, Murray cod fingerlings are weaned in circular fibreglass tanks of various sizes, however, the most effective tanks have been 100-500 L in capacity. Each tank is supplied with a constant flow of aerated water (exchanged at least twice every hour) maintained at 2228oC. These tanks may be part of a recirculation system, or simply a single-pass (flow through) system. Tanks are cleaned once daily to remove uneaten food, faecal material and dead fish. In general, during the weaning phase, disturbance of fish should be kept to a minimum as, once disturbed, fish may cease feeding for a period of time. At high densities the natural aggressive and territorial behaviour of Murray cod is reduced. Fingerlings are therefore initially stocked at relatively high densities of at least 1,000 fish/100L (5-10 kg/m3). Observations made at MAFRI Snobs Creek and commercial Murray cod farms indicate that Murray cod are more sensitive to poor environmental conditions than some other commonly farmed species. Therefore good water quality is important during weaning of fingerling Murray cod. Water quality parameters experienced at MAFRI during successful weaning of juvenile Murray cod are presented in Table 1. These data may be used as an interim guideline for water quality standards for weaning Murray cod under intensive aquaculture conditions. At higher densities, dissolved oxygen becomes a limiting factor. Accordingly, dissolved oxygen levels should be maintained at close to 100% saturation where possible. Simply aerating water may be insufficient to maintain fish at high stocking densities. Although DO is generally maintained around 5-6 mg/l by aeration, it is likely that substantial improvement in the well being of fish (activity, feeding etc) will be observed when pure oxygen is used to increase DO to >10 mg/l. This may also have an added benefit of reduced stress and a greater resistance to infestation by parasites. The application of oxygen to culture systems is not discussed in any detail here but should be based on specific technical advice from appropriately qualified personnel. To prevent the potential introduction of pathogens to the fish during weaning, the water entering the holding facilities must be sterilised. This may include the combined use of microscreen filtration, ozone sterilisation and/or UV sterilisation. In addition, an efficient water filtration system is required on a recirculation system to ensure that the effluent water from the tanks is sufficiently cleaned to remove wastes (faecal and excreted wastes, uneaten food etc.) before reuse. Specific requirements for such systems are available from the literature or from appropriately qualified personnel. Alternatively, water may be sourced from "sterile" sources such as good quality groundwater and dechlorinated town water. In general, pond-reared fingerling Murray cod will not immediately feed on an artificial diet when first offered. Rather, a period of feeding on a "natural" diet is required to break the post-harvest "fast". At MAFRI, Murray cod fingerlings are initially offered an inert "natural" diet of either minced fish or carp roe. These diets must be sourced from a reliable disease free supply and/or frozen for at least 48 hours to reduce the risk of spreading pathogens. When commencing feeding of seedstock, these diets need to be presented in such a way as to ensure fish are not disturbed while eating. Feed may be tossed by hand into the tanks from a short distance, alternatively, it may be placed on a partially submerged screen fitted to a floating raft within the tank. As the appetite of the fish being weaned dictates the amount of feed added each day, fish should be fed to satiation or excess. Usually, at least two (up to 6) feeds are given each day during weaning. Uneaten food should be removed from the tanks at least once daily to reduce water fouling and prevent outlet screens from blocking. The natural diet is fed to fingerlings for at least 2 days and a majority of fish should be actively feeding before the introduction of an artificial diet commences. Fish that are actively feeding tend to school together and will attack the feed vigorously at the water surface. During this period fish will become more accustomed to tank conditions and less affected by disturbance by feeders and people moving near the tanks. Several manufacturers produce artificial feeds (crumbles and pellets) for aquaculture in Australia. However, as yet there is no commercially available diet specially formulated for Murray cod. Many Murray cod farmers therefore rely on diets formulated for other species such as salmonids, barramundi and other native fish, which however may be sub-optimal for Murray cod. The most appropriate artificial diet for weaning and rearing Murray cod is not known, but trials to identify and develop specific diets are in progress. At the present time, the best results at both MAFRI and by commercial farmers have come from the use of commercially available, extruded trout and salmon starter and/or barramundi rations. Pellets or crumbles used to wean Murray cod need to be the correct size for the size of the fish. Fingerlings between 45-75 mm in length readily accept a pellet 1.0-1.5 mm in diameter, while larger fish (75-100 mm in length) should be offered pellets 2.0-3.0 mm in diameter. At this stage of weaning, observations of fish behaviour are critical. To begin weaning, a small amount of pellets is pitched into the tank by hand, from a short distance, preferably during periods between feeding with the natural diet. The intention is to induce a feeding frenzy such that the fish are prepared to ingest whatever hits the water surface. Eventually, if and when the fish attack and consume these pellets consistently and routinely, feeding with natural feed is ceased completely and fish are then subsequently fed solely on the artificial diet. Following the transfer of fish onto the artificial diet, growth and health should be monitored closely. Should fish lose interest in feeding on the artificial diet, their condition deteriorates, or mortalities increase for whatever reason, it may be necessary to immediately stabilise the condition of the fish and to then repeat the weaning process. In order to stabilise their condition, it may be necessary to apply disease treatments and/or place the fish back onto a natural diet before their condition deteriorates further. Fish should be sub-sampled and examined regularly (every 2-3 days) throughout the weaning period and immediate post-weaning period for the presence of parasites as the stress associated with acclimation to tank life and weaning increases their susceptibility to disease and the risk of parasite outbreak also increases. Infestation by external protozoan parasites, such as Trichodina, Chilodonella, Ichthyophthirius (white-spot) and Ichthyobodo (Costia) can quickly lead to massive mortalities. Weaning should not be attempted if these parasites are present, and if such outbreaks occur, fish should be returned to a natural diet and immediately treated to eradicate the parasite, as previously stated. In general, approximately 75% or better of fish will wean onto an artificial diet at the first attempt using the above method. The balance of fish may simply not accept the diets offered and will either die from starvation or be eaten by other larger fish if they are not removed from the population. It is recommended therefore that the non-weaned fish be separated from weaned fish during the first grading, which should be undertaken 3-6 weeks (depending on growth) after weaning is completed. Non-weaned fish should be immediately placed on a natural diet and if their condition improves, weaning may be re-attempted. However, repeat weaning attempts for any one batch of fish frequently result in only marginal success and the viability of this procedure is therefore questionable for commercial producers. Alternative uses for such fish may be considered, including on-rearing in ponds on natural food and/or stocking out for conservation or recreational purposes. Even when applying best practice weaning strategies mortalities will occur uring and after the weaning phase. Some fish may succumb to physical injuries sustained during the pond harvest and subsequent handling; some may be attacked by larger fish (especially if there is a large size difference within the population); while others simply will not accept the diets offered to them. A steady mortality rate is usually observed during and shortly after weaning (1-2%/day), but in the weeks following weaning the mortality rate should decline. As previously stated, expected survival rates following a successful weaning phase should exceed 75%. Fish are fed by hand during the weaning phase to enable fish response to be closely observed and in order to monitor progress, regulate feed quantities and ultimately to ensure that all fish are feeding and being fed to excess or satiation on the artificial diet. However, automatic feeders may also be introduced after fish are fully weaned. In larger tanks, more than one feeding station (more than one auto feeder) may be necessary to ensure that all fish have equal access to feed thereby reducing the dominance of feeding stations by a few fish. Once fully weaned, fish may be placed onto a set feeding rate, which will generally be 3% - 7% bodyweight per day, depending on a number of factors including composition of the diet, size of the fish, and water temperature. The size of pellets or crumbles fed to weaned Murray cod depends on the size of the fish. The following table provides a guide to selecting appropriate size pellets for feeding Murray cod fingerlings of different sizes. During and after the weaning period it is import to remove dead and moribund fish as soon as possible to reduce the development of cannibalistic tendencies by fish. Following weaning the entire fish stock should be graded within 2 weeks into 2-3 size classes to reduce cannibalism and dominance of larger fish over smaller fish. After grading, pellet size should be adjusted to suit the size of the fish being fed. All fish need to be manually inspected to identify if weaning has been successful. Fish may simply be hand graded by eye into different sizes, or be passed through a commercially available bar grader. A simple grader is composed of a box with a slotted base through which only certain sized fish will pass. Boyd, C.E. (1990). Water Quality in Ponds for Aquaculture. Alabama Agricultural Experiment Station, Auburn University, Alabama. 482 pp. Gooley, G.J., and Anderson, G.A. (1991). Growth and survival of intensively reared juvenile Murray cod, Maccullochella peelii, fed on artificial diets. In: G.L. Allan and W. Dall (eds), Proceedings of Aquaculture Nutrition Workshop, Brackish Water Fish Culture Research Station, Salamander Bay, 15-17 April 1991. NSW Fisheries. Pp 46-47. Gunasekera, R.M., De Silva, S.S., Collins, R.A., Gooley, G., and Ingram, B.A. (1999). Protein requirement of Murray cod Maccullochella peelii peelii. In: The Annual International Conference and Exposition of the World Aquaculture Society Book of Abstracts. (Sydney, 26 April - 2 May 1999). Page 301. Ingram, B.A. (2000). Murray Cod Aquaculture: A Potential Industry for the New Millennium. Proceedings of a Workshop (18th January 2000, Eildon, Vic.). Marine and Freshwater Resources Institute, Alexandra. 43 pp. Ingram, B.A., Gooley, G.J., and De Silva, S.S. (1999). Developments in the aquaculture of Australian percicthyids, Maccullochella spp. In: M.J. Wingfield (ed), Proceedings of the Australian Barramundi Farming Workshop (Bribie Island, 12-13 August 1999). Department of Primary Industries, Bribie Island. Pp 54-59. Landau, M. (1992). Introduction to Aquaculture. John Wiley & Sons, Inc., Brisbane. 440 pp. Libey, G.S., and Timmons, M.B. (1996). Successes and Failures in Commercial Recirculating Aquaculture Vols 1 and 2. Proceedings from the Successes and Failures in Commercial Recirculating Aquaculture Conference (Roenoke, Virginia 19-21 July, 1996). Northeast Regional Agricultural Engineering Service, New York. 656 pp. Muir, J.F. (1982). Recirculated water systems in aquaculture. In: J.F. Muir and R.J. Roberts (Eds. ), Recent Advances in Aquaculture. Croom Helm, London. Pp 359-446. Pillay, T.V.R. (1990). Aquaculture Principles and Practices. Fishing News Books, Oxford. 575 pp. Rowland, S.J., and Ingram, B.A. (1991). Diseases of Australian native freshwater fishes with particular emphasis on the ectoparasitic and fungal diseases of Murray cod (Maccullochella peeli), golden perch (Macquaria ambigua) and silver perch (Bidyanus bidyanus). NSW Fisheries, Fisheries Bulletin No 4. 33 pp. Marine and Freshwater Resources Institute Private Bag 20 Alexandra. VIC. 3714. Tel. 03 5774 2208. Preferred way to cite this publication: Ingram, B.A., Missen, R. and Dobson, J.L. (2001). Best Practice Guidelines for Weaning Pond-reared Murray Cod Fingerlings onto an Artificial Diet. Marine and Freshwater Resources Institute Report No. 36. (Marine and Freshwater Resources Institute: Snobs Creek).